Let’s look at this passage at little deeper for a moment. The first thing we learn is the overwhelming humility of the Lord Jesus Christ! He didn’t ride into Jerusalem on a nobleman’s stallion or in a conqueror’s chariot. Jesus rode on the foal of a donkey, so that the Scriptures would be fulfilled – the Scriptures He wrote (2 Timothy 3:16). And He wrote into the script the most unlikely of animals that would carry the King of kings and Lord of lords upon his back. Palm branches were symbolic of goodness and victory in that day. Revelation 7:9-12 describes how the saved from every nation will raise palm branches to honor Jesus. During Holy Week, the people were waving branches to honor the Messiah, eagerly anticipating a smashing triumph over the hated Roman oppressor . . . not a triumph over sin. They were expecting a political leader and military messiah who would restore Israel to her former glory. 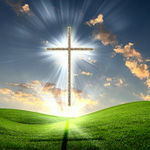 They gave absolutely no thought to the notion of a Suffering Servant who would come to take away the sins of the world. Just five days later, when the people realized that Jesus would not be expelling the Roman oppressors, their shouts of praise turned into screams of condemnation: “Crucify Him! Crucify Him!” (Luke 23:21). Before the fresh-cut palm branches had lost their healthy green color, the people were seeking the death of the One who had come to give them life. However, Jesus was undeterred. He was on a mission, and He would not let anything stand in His way – neither the applause of men nor their condemning cries. He was in the center of the will of His Father . . . and in a few days He would be hanging from a cruel cross, bleeding and gasping out His last agonized breaths. Regardless of where this finds you today as we move through Passion Week, take some time to reflect on the One who came in unimaginable humility to conquer both sin and death so that you might have eternal life. The Bible says in Hebrews 12:2, “For the joy set before Him He endured the cross, scorning its shame, and sat down at the right hand of the throne of God.” It will lead you to raise your voice in thanksgivings, praise, and celebration over what Jesus has done!